The Obama administration still has not fully recovered all the three-year work permits it issued in violation of a federal court injunction on executive amnesty, according to the Washington Times. The three-year work permits are an aspect of the executive amnesty programs U.S. District Court Judge Andrew Hanen halted in February, when he ruled in favor of 26 states challenging actions. With his injunction the administration was supposed to stop implementation of Deferred Action for Parents of Americans and Lawful Permanent Residents (DAPA) and expanded Deferred Action for Childhood Arrivals (DACA). 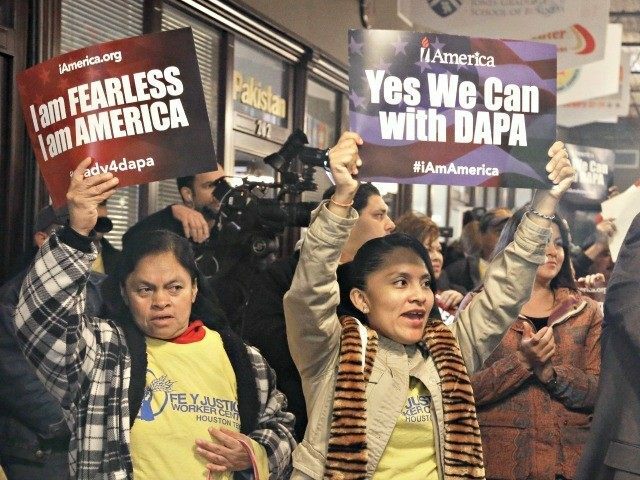 The extension of DACA also included extending work permits from two to three years. Despite the injunction the Obama administration issued 2,000 three-year work permits, on top of another 108,000 three-year work permits it issued before the expanded DACA’s scheduled start date and the February injunction. The Washington Times notes that while there are disagreements over how to deal with the 108,000 permits, the 2,000 all sides concur were illegal and must be rescinded. According to the Times’ report, however U.S. Citizenship and Immigration Services has not been able to get all of them back promptly. At a hearing last week, Hanen was outraged that the matter had yet to be cleared up. The Express-News reports those actions include sanctions. “There’s no doubt with regards to the 2,000 that the government violated the injunction,” the Express-News quoted Hanen.